Turing was a very good marathon runner, and even tried out for the British Olympic marathon team in the 40s. So a street named after him in the Olympic Park is quite a fitting honour! What i find equally remarkable is the break with established street sign tradition – is this a first (where background details are provided to explain the particular entry) for London? Presumably the signage was created by private developers and therefore didn’t need to follow long-established mores – is this another first then – the private sector actually enhancing the public sphere/going beyond established custom and practice? By degrees we arrive at the truth – a corporate re-branding exercise laid bare. OUT LB Newham (toxic brand), IN trendy gay visionary of the computer era (who also helped save the country from the Nazi horde). I find questions about and reasons for street naming (and renaming) fascinating, wherever it is in the world. Layers of history revealed (and sometimes obliterated). Google found this 2017 Street Name Plate Standards document (described as private and confidential on the title page) by an organisation/company/group called Applied Wayfinding for the LLDC. 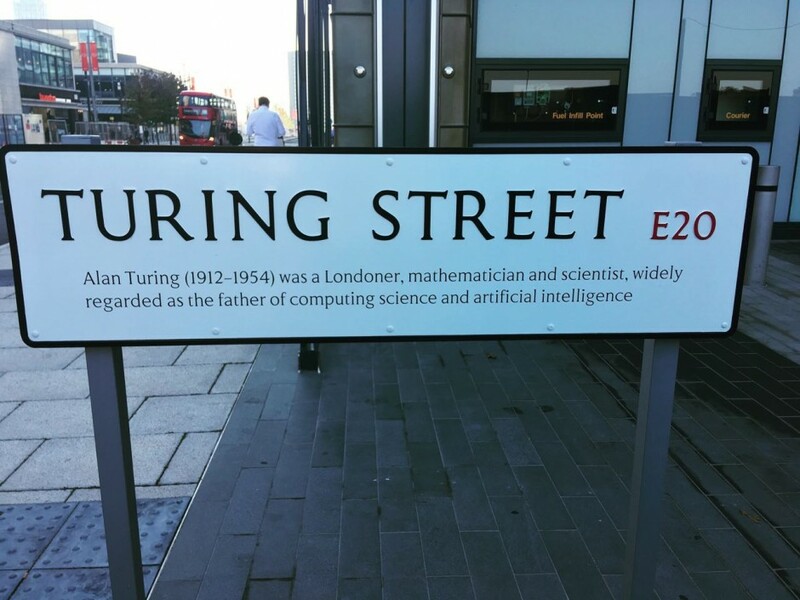 See p 3-6 for Turing Street.